MEDFORD, OREGON (MAIL TRIBUNE) -- A Nigerian national who testified against his brother in a complex tax fraud case was sentenced Wednesday in U.S. District Court in Medford to seven years for his own role in the multi-million-dollar scheme. Michael Oluwasegun Kazeem, 24, was sentenced to 84 months in prison and ordered to pay nearly $4.3 million in restitution for his role in a fraudulent tax-return ring. Prosecutors said the fraud scheme, organized by his brother, caused significant financial harm to thousands of people, removed an Internal Revenue Service web page and lost six figures worth of business for an Oregon-based employment services company compromised in the scheme. Kazeem will be deported to Nigeria at the end of his sentence. Between 2012 and 2014, Kazeem filed at least 1,479 tax returns using stolen employment identification numbers, causing nearly $3.9 million in losses, many to Oregonians, according to Assistant U.S. Attorney Byron Chatfield. The tax returns were filed using 13,203 accounts stolen from Lincoln City-based CICS Employment Services, a company that performs pre-employment background checks, according to Chatfield. Of those stolen accounts, 5,028 belonged to Oregonians. “This is just what we were able to come up with on the search warrants,” Chatfield told District Judge Ann Aiken. Some 10,139 fraudulent federal tax returns using thousands of unsuspecting people’s employment information were filed between 2012 and 2014 in a ring organized by Kazeem’s brother, Emmanuel Oluwatosin Kazeem, 34. He was found guilty in August of multiple wire fraud and aggravated identity theft counts and remains lodged in the Jackson County Jail, with a sentencing hearing set for March. Between the two Kazeems and four others facing federal charges, the IRS lost more than $11.6 million. Although Chatfield commended Michael Kazeem for “stepping up” to testify against his brother, he noted the man had engaged in credit card fraud prior to 2012 when he lived in Nigeria, and that Kazeem had engaged in a “sham” marriage, paying a woman $500 a month to establish residency in the United States after his student visa ended. He also branched out on his own fraud scheme after Emmanuel Kazeem was caught. The owner of CICS said he lost $420,000 worth of business, and the thefts also took a personal toll as he handled hundreds of calls from distressed victims, many with limited means, according to Chatfield. 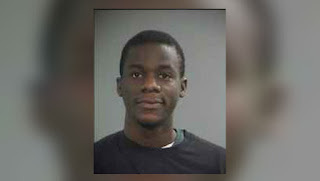 Michael Kazeem apologized in sometimes broken English to his victims.